The new products will officially be available on the MFT online store on November 1st at 10:00 pm EST (= Europe: November 2nd at 3:00 am CET). How fun is this set? I’ll sure use it often! Love those cute sloth! I first created the Polaroid frame. I die cut a square from Square STAX Die-namics Set 1 and I then cut around the negative area with a trimmer. This allowed me to leave enough space for my sentiment. 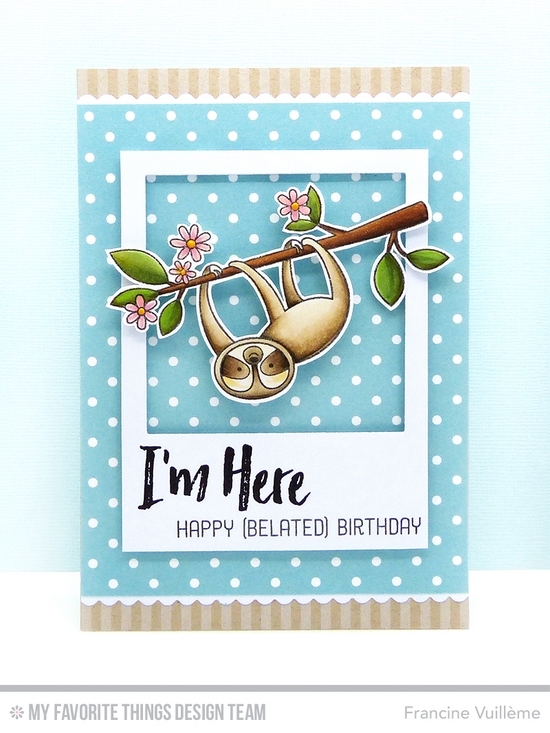 The "I’m Here" is from the Deepest Sympathy set and the "Happy [belated] birthday" is from the Sweet Sloths set. I stamped them to the frame with Black Licorice hybrid ink using my Mini Misti. I then made a card base from Sweet Tooth cardstock and I cut down to size all background papers. The blue dotted paper is from the Birthday Blowout paper pack and the kraft paper is from the Kraft Collection – Solid Stripes paper pack. The sweet tiny scalloped borders were cut out from Blueprints 20. Next, I colored the sloth with Copic markers and die cut the image with the coordinating die. To finish off my card, I fixed all layers together with adhesive tape and foam pads. This card is adorable Francine. Love the colors you used, has a very fresh look. Francine, Adorable card! Love that Sloth. The flowered branches are a nice touch! Idal color combination to show off the darling sloth! beautiful coloring for this card. Francine, I love your card! Your colors and coloring are perfectly done; I love the dies you used; the sentiments are perfect; and I love the paper you used. The blue polka dotted paper really sets off the sloths! Thanks for sharing. Very cute card. Great polka dotted paper. Thank you for sharing your design.